Six years ago, the Mo and I used to go to Phnom Penh Restaurant almost every week. We lived in our old apartment then and didn't have a washer and dryer, so we hauled our dirty clothes to the nearby laundry mat. There was a discount midweek so we always went on a Tuesday to save a couple of quarters on the wash. If I remember correctly, I think they also threw in a couple minute extra on the dryers as well. Oh the things we used to do to save money! The restaurant is located on the busy area of Westford street congested with other grocery stores, Asian salons, legal practices and a liquor store. Parking is bit tough on the main street but there is ample parking in the lot behind the restaurant with a back door entry for convenience. We've eaten almost everything on the menu. My favorite is the fried whole fish with "Tuk mpol" a sweet and sour tamarind sauce with ground pork. The "Student fried noodles" is also very good; it's almost the same thing as pad thai or "Kuy tiev cha." 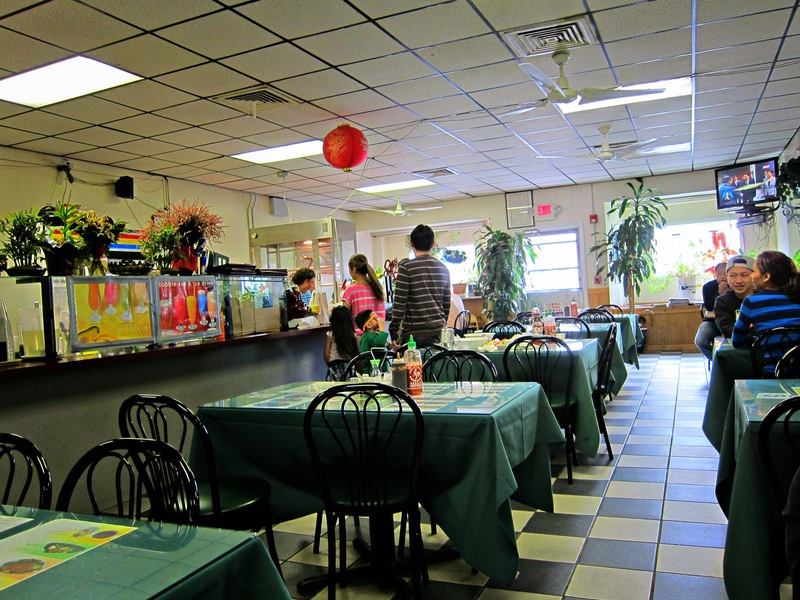 The restaurant is spacious and the decor is in line with many of the other Cambodian restaurants in the area. There are TV's on the wall and plants throughout the restaurant. The Chinese lanterns with Chinese letters suspended from the ceiling suggests that the owner may also be part Chinese or the Chinese family lived in Cambodia. This is also very common with Vietnamese. The menu also featured many Chinese entrees such as Ma Po Bean Curd and Eggplant in Szechuan sauce. 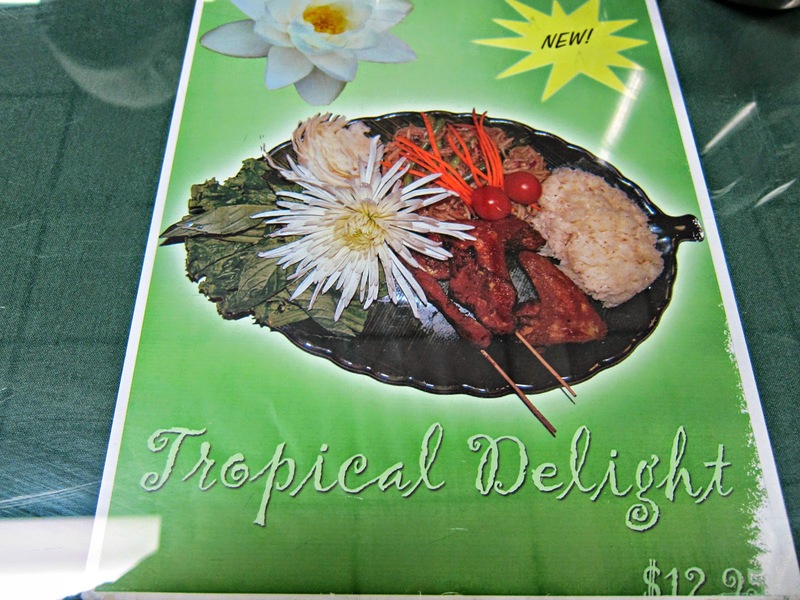 Similar to Simply Khmer, the Cambodian restaurant also had a combination platter with sticky rice, papaya salad and wings. Their version included an additional (2) beef skewers and was priced at $12.95, a little more money than Simply Khmer's version. Since we had plans to eat lunch in Boston, we stuck with a light breakfast. 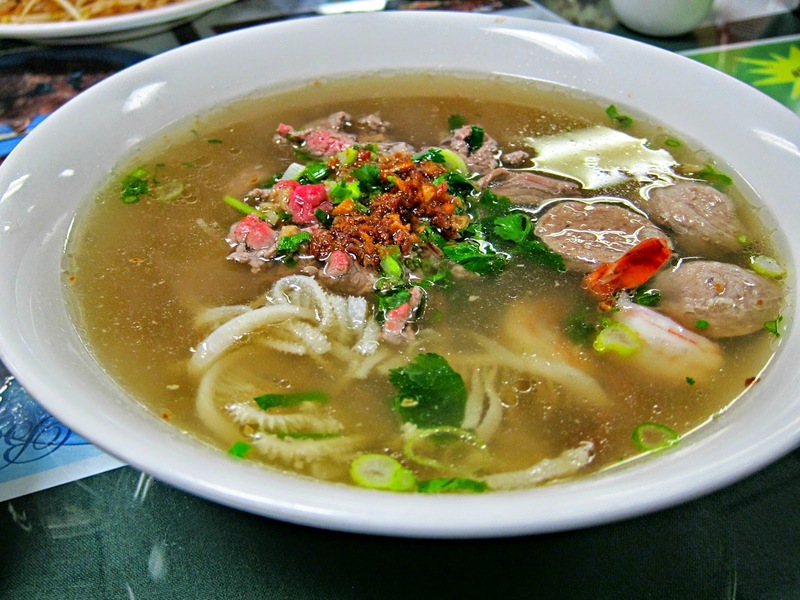 I ordered the Kuy Tiev, Cambodian rice noodle soup. The special version comes with shrimp, meatballs and tripe. I love that there was lots of garlic. I didn't get the fried crullers because I didn't want the extra carbs and calories. The broth was just OK and lacked flavor. Sometimes restaurants purposely do this so the guests can add their own condiments and customized it to their liking. I, on the other hand believe that a great bowl of noodle soup doesn't need any additions. 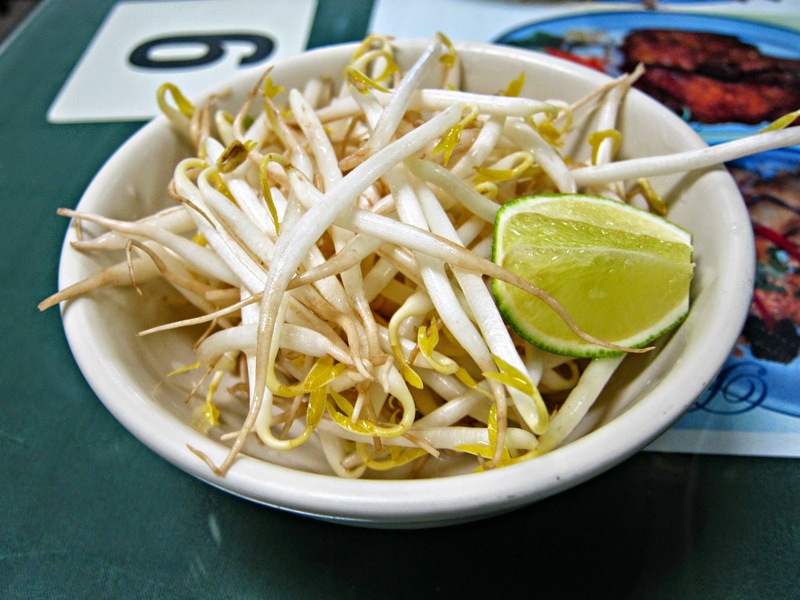 The soup comes with the usual bean sprouts and lime. 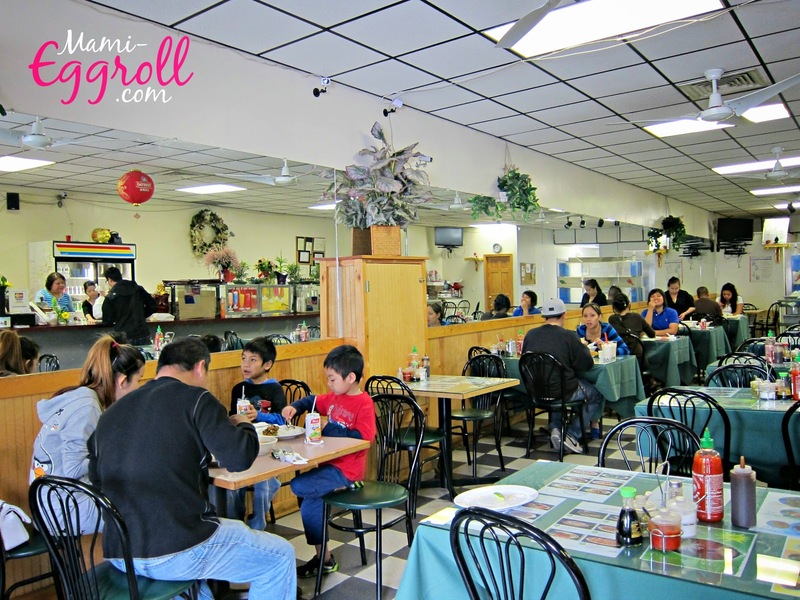 Unlike many other Vietnamese restaurants and some Cambodian restaurants, there were no Thai basil or other herbs provided on the side. 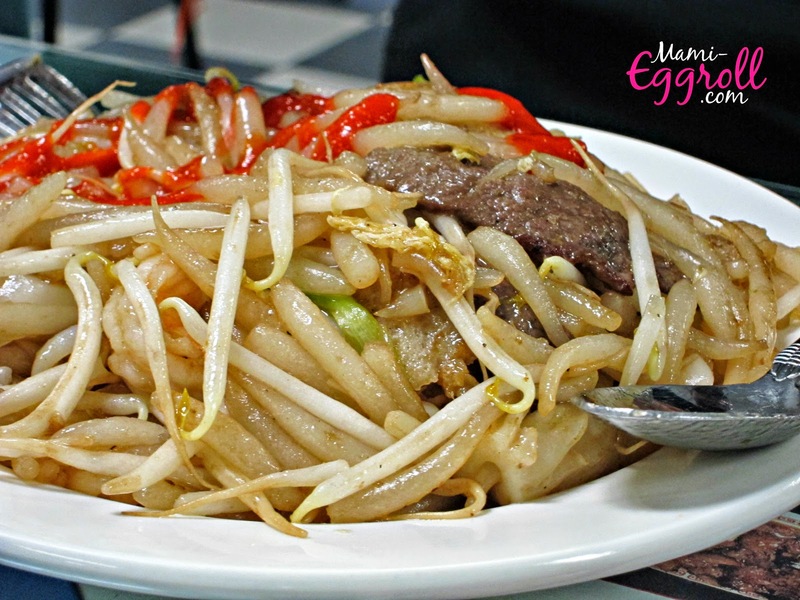 The Mo ordered Lhort cha, which is a thick stir fried noodle dish resembling the texture of udon noodles. The dish was served with Cambodian sweetened dish sauce. Some restaurants serve it on the side and some cook with it already in the dish. I prefer the later. The dish looked plain and boring. It lacked color and luster. Of course he added some Sriracha hot sauce to give it a kick. The Mo said it was just OK. 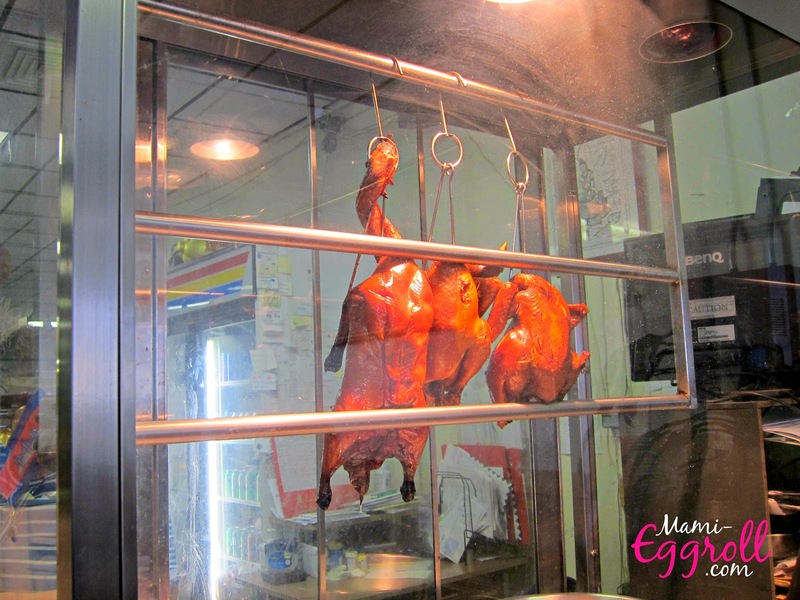 The restaurant also features whole roasted ducks at $ 25.00 each. They are great for holidays and New Years. I'm skeptical of the turnover and would prefer to get my roasted ducks from China Star on Broadway street when I know they are prepared daily. 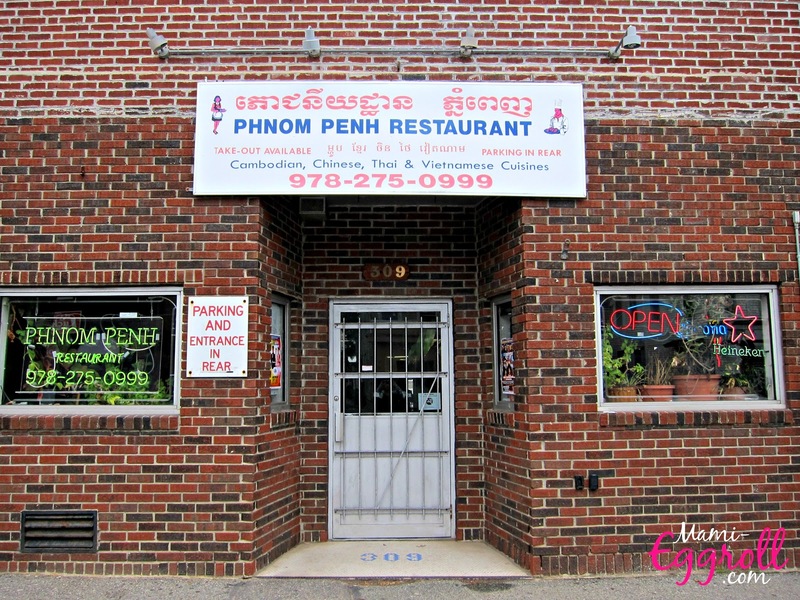 We have friends that love Phnom Penh restaurant but we will probably just stick with our favorites: Heng Lay and Simply Khmer.